I really do not enjoy chopping up onions (does anyone? ), but I do love how they taste in recipes, so I’ve found that my best options are to buy bags of frozen already-chopped onions at the store (which I have done when I’ve found a good sale on them!) or to chop them in bulk and freeze them. I usually opt for the latter since it just seems fresher to me, for some reason. 1) Cut off the ends, peel, and cut in fourths. 2) Stick in the food processor and chop. If you don’t have a food processor, you can also use a blender, though it will chop the onion pretty fine. 3) Measure 1/2 cup of chopped onions into small sandwich baggies and then stick these into a freezer bag (as shown above). Freeze. You can then just pull out a bag of chopped onions and use them in recipes whenever they call for chopped onion. Doing them in bulk like this saves a lot of time and effort–and tears! However, if I had followed , I wouldn’t have had to worry about the tears! Thanks so much for the tip! I HATE chopping onions, but like you, love the taste of them in recipes. I never even thought about putting them in the food processor…that’s brilliant! I only recently discovered how wonderful a food processor is for shredding cheese, so I’m so glad to find yet another practical use! Once the onions are chopped, use an old ice cube tray to measure the portions and freeze. The you can pop them out of the tray and place them in zip lock bags. No muss no fuss. I also freeze onions already chopped. I just freeze them in quart size bags, flattened very thin.. then break off the “chunk” I need. My mom always did this and I do this now as well. I have a Tupperware chopper thing that works great. I lay my onions on some wax paper to flash freeze, then put them in a ziploc. Same exact process for my bell (green/red) peppers. Makes life a little more convenient! @Laura @ Frugal Follies, I’ve found the same to be true and was so excited when I figured out that s solve the onion tears issue. Now if I could just remember to put them *in* before chopping the onions! In the past, when I have frozen whole onions, they have defrosted to a mushy mess. Is this resolved in the way you freeze them because the onions are chopped? Maybe that was my issue. Thanks! @Kacy, I’ve never had trouble with them being mushy if they are chopped before freezing. @Kacy, I think I’ve had the same issue if trying to defrost and use the onions fresh. But when putting them in with a meal or sauteing/cooking right away, the mushy mess doesn’t matter as much. In fact, when sauteing I don’t even defrost them – just throw the frozen diced onions into the pan. I freeze onions all the time. I rarely use a whole one at once when I need fresh. I will diced them, julienne, rough chop, mince, and leave it whole (or halved and freeze. That way I have them in whatever form I will need them and just use them straight from the freezer! Cindy, we were going out of town, so I just put the whole onions in the freezer. So you’re saying they’ll be OK? Was planning to cook/ crock pot with them…. How should I prepare one? Won’t be a mushy mess? I do the same as far as freezing cut-up onions ahead of time. By the way, green peppers work great too! (especially in summer when there is an abundance from our friends’ gardens). I highly recommend the Pampered Chef food chopper for these sorts of jobs. Cuts the work in half, easy clean-up (dishwasher) and the pieces are uniform. Does anyone have problems with the frozen onions stinking up your freezer? I’ve tried this once, and even doubled bagged them, and my deep freezer reeked of onions! That was even with a large box of baking soda in there. I gave up after that. @Zena, I had the same problem! I put each chopped onion in it’s own small freezer bag. Then I put the small bags into a larger freezer bag, seal and then put that bag into another large freezer bag and seal. You do have to use multiple bags, but I re-use them and it’s not a problem. @Zena, I have had the same problem, I have even double and triple bagged them. It smells up the whole freezer. does anyone have a solution for this. that’s what I was thinking would happen! I’ve stored left-over chopped onion in my fridge before- HUGE mistake. The only way I think this would work is if you saute’ed them before freezing. But then, that’s not saving you much work! I freeze chopped onions all the time! I also freeze green peppers that I’ve cut into strips. That way I can either finishing dicing them or leave them as is for different recipes. I find it’s the best way to keep green peppers when you find them on sale! Along with freezing onions I like to chop raw carrots and celery for the freezer. It is very convenient to add these to a pot of soup and because the vegetables have been frozen they do not take as long to cook. @Patty, So you can freeze celery the same way? I’m always wasting celery because I can never use up a whole bunch at one time. I recently froze celery, carrots and potatoes but you need to blanch them first. I have never frozen without blanching. I have used them twice for a pot of roast and they turned out Great! I will do that from now on since I usually cannot use a whole bag of celery or carrots before they go bad and it’s easy to just pull out of the freezer to add to a meal! Great tip! I also save my onion skins and cuttings in the freezer to use when I make homemade chicken broth. here in la. every recipe (it seems) starts with the ‘holy trinity’: onions, green peppers, and celery. I like to chop these together and freeze also. Great when you’re limited for time in the kitchen. When I have onions that have been around too long or partial onions in the refrigerator, I will chop them up and put them in a zip lock in the freezer. I also find this to be a handy way of storing my green peppers from the garden in the summer. They usually last me well past the season! But…I must admit that I’m guilty of buying the frozen package of chopped onions and peppers at the store. I love have the two combined into one package and the truth is…they’re cheaper by the pound this way. I’ve never thought of freezing chopped onions…great idea! I’ll have to do the carrots and celery too because we never eat the whole bag of either when I get them for soups/stews! One way I cut down on tears when cutting onions (the only way that works for me!) is to rinse the onion in cold water after I’ve cut it into halves or quarters. The water washes away the “molecules” (or whatever…I can’t think of the right word!!) that cause our eyes to tear up. Also having them in the refrigerator before chopping helps. This is wonderful! It’s a simple solution to a BIG problem that many of us have. I always call my husband to cut the onions for me. Thank you. I find putting the chopped onions into the snack size bags instead of sandwich size are perfect proportions for most recipes. I also freeze chopped onions and peppers in bags, flattened out. Sadly, I just used the last of my chopped peppers from the summer harvest. I also run baby carrots through the shredder of my food processor and freeze them flat, when it looks like we won’t finish a bag in time before they go bad. I throw them in casseroles, spaghetti, soup, etc. I do this too. It’s really good to keep in mind when huge bags of onions are on sale (or reduced for quick sale because they are fixing to go bad). We live in Georgia and visit Savannah quite a bit. We drive right through Vidalia, Georgia where they sell 25 lb bags of Vidalia onions at the gas stations pretty cheap. I always try to pick up a bag and chop and freeze them. I attended a cooking class this weekend. It was on knife skills. One of the things the chef taught us was the reason we cry when we cut onions. The first is the time of year. When we buy onions off season the chemical that makes us cry is in larger quantities in the onions. The second reason: Your knife is not sharp enough. If your knife isn’t sharp enough then you’re bruising the onion and releasing the chemical. When you have a sharp knife then it will quickly and easily slice through the onion. If you have the problem of smelling the onions in your freezer, wrap them in foil! there is something about the foil that keeps them from smelling up your fridge/freezer. The foil keeps the onion dark and dry, not to mention limiting its affect on other foods. It’s just like washing your hands with something stainless steel after chopping them to get the smell off your hands. I have also have sisters that chop onions and than they put it in ice cube trays to freeze and once frozen put the cubs of onion in a bag. I have one of those “veggie chopper” things (like this: ), and while it is a pain to clean, it’s worth it for chopping really big loads of veggies very quickly and then freezing! Glad I found you! I am trying to save a lot more and it looks like you have a lot of great content. After chopping my onions and green peppers, I usually spread them in a single layer on a cookie sheet, and freeze for one to two hours, then put them in a ziploc bag. It keeps them from coming out in one big chunk! @Lenetta @ Nettacow, Have you tried chewing on a piece of bread while chopping? This weirdly works for me. Not perfectly, but it helps a ton! @Emily Kay, weird but this works for me too!! @Emily Kay, That’s what I do too. I use a few unscented votive or tea light candles scattered near my cutting board and rarely have any issue with tears. You can get a large package of the tea lights at Ikea or any craft store for a good price & they’ll last forever since you only need them for a few minutes at a time! Put a (scented?) votive candle in a cup, light it and keep it nearby on the counter when chopping onion.It ‘wicks away’ the stinging fumes. On the chop and freeze line, I grate carrots or zucchini and keep them in the freezer. Nice to have easy carrots to put in soup. Sometimes it’s hard to ‘sell’ the big chunks of carrots to the family in the chicken noodle/split pea/bean/lentil soup. I also cut and de-seed peppers that I find on sale (‘day-old rack’?) or at the farm mkt to freeze. One bell pepper can give 4 or 5 thick slice rings. Rings go into a zipbag and can be pulled out a couple at a time to chop into chili or pasta sauce. When I’m feeling truly lazy, I break them by hand into the sauce. No extra knife! With frozen chopped onion and breakable peppers and a 1-lb baggie of cooked frozen ground meat, you’re most of the way to sauce. I have found that I avoid the tears when I put the onion in the whole onion (skin and all) into the freezer for about 5 minutes. This has worked for me without fail. I also saw this on the Food Network Show, Food Detectives. Brilliant! I’m definitely going to do this! Fruits and vegetables chosen for freezing tend to be processed at their peak ripeness, a time when—as a general rule—they are most nutrient-packed. On the other hand, fruits and vegetables destined to be shipped to the fresh-produce aisles around the country typically are picked before they are ripe, which gives them less time to develop a full spectrum of vitamins and minerals. Outward signs of ripening may still occur, but these vegetables will never have the same nutritive value as if they had been allowed to fully ripen on the vine. In addition, during the long haul from farm to fork, fresh fruits and vegetables are exposed to lots of heat and light, which degrade some nutrients, especially delicate vitamins like C and the B vitamin thiamin. I have a ton of onions frozen in my freezer. What I do is freeze them in muffin tins and then once they are frozen take them out and store in a gallon ziplock. Then when you need onion for a recipe you just pull out the amount you need. Usually one is about half a cup. 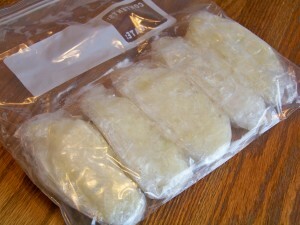 To reduce odor in the freezer, it helps to use freezer bags instead of storage bags. They look the same but the freezer bags are made of a thicker plastic that doesn’t let the odors through so readily. Keeping onions in the fridge helps a lot with burning eyes, but my girls always wear swimming goggles to totally shield their eyes. It looks ridiculous, but who doesn’t need a good laugh now and then? I thought that her idea was a little time consuming and I barely have any freezer, so this does not work for me. I put the whole onion into the freezer for about 30 min- 1hour and then chop them up and bag them. Works just as well. SO funny! I have my husband do multiple onions at once. I seriously cannot even be near the kitchen though b/c they make me cry so bad! I hadn’t thought of freezing them though… great suggestion. I just chopped onions and put them in a zip lock. Then I break them apart and measure out what I want. I don’t bother with pre measuring. Easy peasy. Ha I def. need to do this. Not only b/c its not my favorite task but because my three year old has found where I keep them and thinks it the funnest thing to spread the peels throughout the house and I’m finding my onions all over the house! So thanks for the timely tip!!! I do the same thing! My mom always did this growing up. I started putting them in ice cube trays (sprayed first with PAM) for a few hours in the freezer first and then place in a ziploc bag when frozen. So easy! i always keep a wet bar of soap next to the cutting board when i chop onions. The alkali in the soap nullifies the acid in the onions….by the time the vapours reach my eyes, they are neutral…so i dont cry… yay! my mom taught me this. This is a great idea. I have been wondering if onions could be frozen. Thanks! I’ve done this for a while now too — WONDERFUL isn’t it!?! Another thing I’ve done is to cram them down into ice cube trays. Once they’re frozen I jsut pop them out and into a bigger freezer bag. Then they’re in little chunks just ready to be added to anything! I am a 72 yr.old Grandmother and just found your website. I am going on a trip and have about 6 onions I hate to throw away so now I’m going to chop and freeze them. So happy to have found this website. To save a few steps, here are some more tips. 1. Saute or caramelize the onions first. For long term storage, store in food saver bags. 2. Use an onion chopper. I use the Vidalia onion chopper and it saves a ton of time.